Pretty. Damned. Fast. was founded in Brooklyn, New York, but our love for cycling and our contributors are worldwide. Want to contribute, advertise, or just say hi? Shoot us an email or visit us on Instagram. Photographer Marshall Kappel and I have been walking around in the rain trying to track down Laurel Rathbun at Zilker Park in Austin, Texas, but with everyone so bundled up its hard to tell who is who, everyone looks the same. Cold. Muddy. Then a tall figure appears in my peripheral vision. I look up to greet someone whom I assume is Laurel, but I can barely see her from under my hooded rain coat. I don’t think my neck can adjust to that angle. One might think her six foot tall frame would come across as imposing or intimidating, but I immediately feel like this girl is cool. She is someone that, if I were still in high school, I would want to be friends with. We quickly greet one another and decide that we should find a dry, preferably warm, place to sit. We slip and slide our way through a muddy field to where a cluster of cycling teams have set up camp. She leads me to one that looks promising, it is enclosed. We each take a seat on black camp chairs, scooting them as close to the space heater as we possibly can without searing our pants. The freezing rainy weather wasn’t exactly what two Coloradans were expecting from Austin, Texas, but it’s what we got. We just sit in the tent for a few minutes, not really speaking, but rather making observations about how numb we are. After a few minutes of placing our feet and hands dangerously close to the space heater, our extremities regain some dexterity. Our conversation starts flow a bit better now that our lips don’t feel like rubber. Laurel is unassumingly calm for having just finished a cyclocross race on the sloppy nationals course. She doesn’t appear to be concerned about how she just broke her only pair of bike shoes, that she has to participate in an elite race tomorrow, or how in two days she flies to Indiana to start classes as a freshmen at Marian University. Right now she is talking with me about the 57 pairs of shoes in her closet (she counted) and how chocolate chip cookies are really the only acceptable type of cookie. I know she is eighteen years old, but that age doesn’t seem to fit her. She has the enthusiasm and excitement of a nine year old on Christmas eve, but the maturity and humorous wit of someone much older than eighteen. To get the ball rolling I ask her the standard question about how she first got started riding bikes. Her face lights up and a big smile comes across her face. I soon come to find out that Laurel has always been into biking. She informs me that the first time she can recall riding was when she was six or seven years old. Her first bike was a purple Gary Fisher mountain bike that still resides in her parents house in Monument, Colorado. The bike never donned training wheels because big kids don’t use training wheels. At least kids with Laurel’s “don’t worry, I got this” attitude. While her confidence didn’t prevent her from being a bit fearful or from falling down, it didn’t stop her from riding. She remembers her dad would run next to her, holding on to the seat to keep her from capsizing. After a while, Laurel realized that her dad, despite saying he was holding on to the seat, was in fact no longer holding on, no longer protecting her from falling on hard pavement whooshing beneath her two wheels. She was cruising down the street all on her own, dad at her side, not falling. From that moment on, it seems like Laurel has been inseparable from the world of biking. She began racing bikes shortly after that initial ride. She started her racing career with triathlons, but after suffering from knee issues and coming to the realization that “running is a lame form of transportation because riding a bike is so much faster,” Laurel focused her attention on biking. 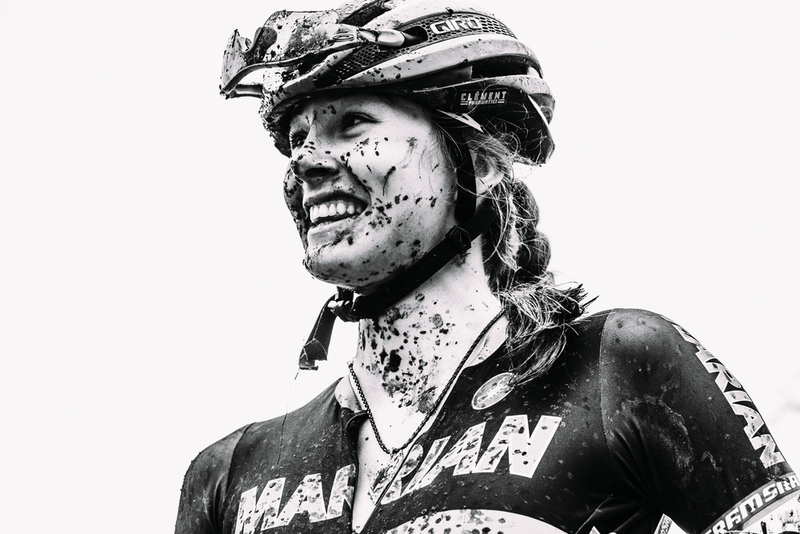 While she competes and excels on the road bike, her true love is cyclocross. She noticed that she could train for six hours a week and still compete at a high level. Which is pretty key for someone still in high school, juggling classes and a social life. Not only did she manage to do well in school, but she also did well on the bike, pulling off four national championships on the road and track, a criterium win at the 2012 road nationals, a stage win at the Tour de la Releve Internationale de Rimouski, three top 10 finishes at UCI cyclocross races and most recently placed fourth at cyclocross nationals. Laurel attributes her success to her stubborn disposition and to having the best training partner, her dad Tom. Just like when she was seven, he stays right next to her. For over ten years he has been pushing the pace during intervals on the road. Though, both he and Laurel admit that she has him beat once the bikes leave the pavement and hit the mud. But that’s all about the change when Laurel leaves for college in mid-January. Reese Ruland lives in Fort Collins, Colorado. An ultra runner/road biker, she spends her days on running on the trails and riding her bike, Fox, around town. She founded Black Widow Cycling Club (www.blackwidowcycling.weebly.com), an all womens biking team. When she isn't enjoying the outdoors, she can be found drinking fine loose leaf teas. Marshall Kappel is a lifestyle and sports culture photographer. He spends most of his time on the road, Paris or NYC. His photographic stories focus on the people and faces that make cycling such a beautiful pursuit. © Pretty Damned Fast LLC, 2019. Unauthorized use and/or duplication of this material without express and written permission from this site’s author and/or owner is strictly prohibited.